Postings that include a video or other multimedia presentation. So why the bee pictures? It’s all about climate change and the significance of these little residents that we share our planet with. A point is that climate change will certainly have an impact on the human population but perhaps even more serious will be the harm it does to Earth inhabitants like the Bee and its important work of pollinating plants. Here is an interesting an informative video from NASA about Bees, pollination, and how the Bees are used in a study about climate change effects..
Keep informed about climate change with these smartphone apps from NASA. Remember: Earth is our home, our only home. If you have followed my postings you know that I am an avid fan of watching for the International Space Station passages over my part of the world. I especially enjoy capturing the ISS as it travels past celestial objects like the Moon. In an interesting twist it is possible to take advantage of the ‘bird’s-eye’ view from the ISS and see what the ISS astronauts see as they orbit the Earth. Listed below are some of the web sites with pictures taken by ISS astronauts, however I wanted to call attention to this web site – ISS EXPS 40 & 41. This web site has a map of the world that links tweets from the astronauts to accompany the pictures they took of the Earth’s surface. Additionally the web site shows the position of the ISS updated every minute so you can track its current flight and position as you browse the pictures. Click here to go to the ISS Exps 40 & 41 website. One of my college classes is Physical Science, which is essentially a general science course covering Physics, Chemistry, Earth Science, and Astronomy. Part of the class, 10% of the grade, is from having students do independent projects on topics relating to the class content. They may do anything from research, article summary’s, writing poems, developing lesson plans, and basically using their own interests in selecting the projects. One of my students wrote and performed a song that fits very nicely in the section we covered on Earth Science – plate tectonics, plate boundaries, subduction, faults (not mine! ), and volcanoes. On today’s date, 23 December 1968, the crew of the Apollo 8 mission entered lunar orbit following a 3-day flight that started with lift-off on 21 December. After entering lunar orbit the 3-man crew orbited the Moon 10 times over a period of 20 hours. It was during the 4th orbit on 24 December, due to a combination of things, that brought the Earth rising above the lunar horizon into view through two of the view ports on the Apollo 8 spacecraft, leaving us with a remarkable and historic picture known as Earthrise. Use these links to see the two animated graphics above full size: Mission Flight Path – Lunar Orbital Insertion. Click here to see images and videos from the Apollo missions at the Apollo Image Gallery. The video (22 min) below is from NASA and contains highlights of the Apollo 8 mission from lift-off through lunar orbits to splashdown in the Pacific Ocean. Click here to go to the Moving Video Archive to download a copy of the video in different formats and sizes. This graphic comes from the Space Weather website. Click here for more information about a coronagraph. Click on graphic to see an animated full size version. Superstitious? The banner graphic at the top of the page shows Comet ISON as may appear on Friday 13 December. If my software is simulating the view correctly then the comet on that date will still be showing a tail reaching to Gemma, the ‘crown jewel’ in Corona Borealis the Northern Crown, and Comet ISON should be between 5th and 6th magnitude. At that magnitude range the comet will be visible to the naked-eye under dark skies and with optical assistance should be a great sight. Click here to view or download the animated graphic from the Huffington Post page on Google+. Here is a really neat interactive online Comet ISON simulator showing the path of Comet ISON from a space view of the inner solar system, and an Earth view – a Planetarium-like view of the horizon and starry sky where the comet is located. The simulator has a timeline along the bottom that highlights various points along the comet’s path including when it is predicted to become naked-eye visible. Click on picture by Damian Peach to see it full size. 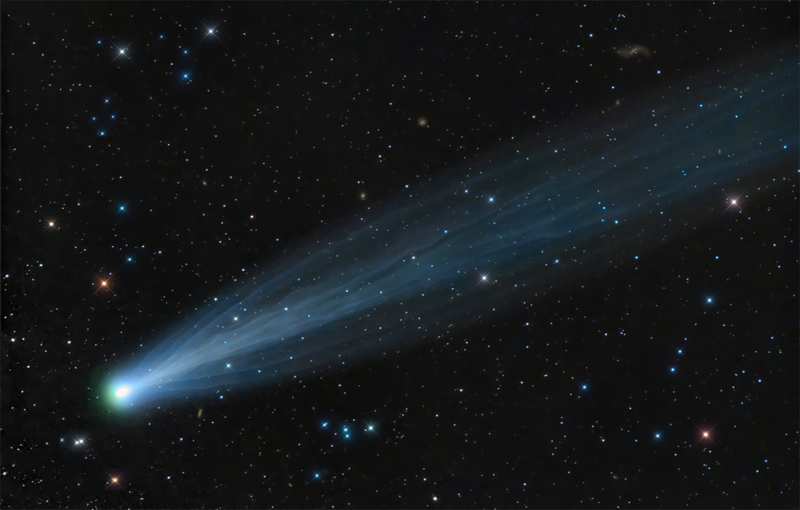 The comet has brightened considerably as it approaches perihelion in less than two weeks. Here is a beautiful picture of the comet from yesterday by Damian Peach. Thanks to Universe Today and editor Fraiser Cain for the heads up on this Comet ISON addition to the online Solar System Scope simulator.